The big expansion we started on so many months ago, Documentation, is finally out of private beta! Also go and play with Documentation for a bit, read through the help pages, and take the tour. Anywhere you see a glowing blue dot, you can click to get additional information. You can click the (?) at the top of a page to make all the blue dots visible again. We want to hear from you about what’s missing, and what needs work. Upvote the good content you see, downvote the bad, request what is missing, and contribute where you’re comfortable helping out. We’re all in this together. While you’re doing all that, remember: Documentation applies a lot of the lessons learned from Q&A, but it’s not Q&A. While the basics translate (peer review, by developers for developers, and be excellent to each other) many of the specifics probably don’t. make perfect sense in Q&A, but don’t really in Documentation. Similarly, very narrow questions are great for Q&A but very narrow requests aren’t good for Documentation. There are a few things we don’t think will work very well in Documentation, like.. There are several ways help improve Documentation. First, just browse and make the changes (just click the pencil icons) you think are improvements (and if you can’t make them, you can always request them). Second, you can browse outstanding requests for new topics and examples in a tag’s request list. Finally, a tag’s Documentation Dashboard lists all the proposed changes, topic requests, and improvement requests. You can browse from the dashboard, or subscribe to queues to have some pending items pushed to your Stack Exchange Inbox periodically. Several tags already have Documentation that was created in the private beta. 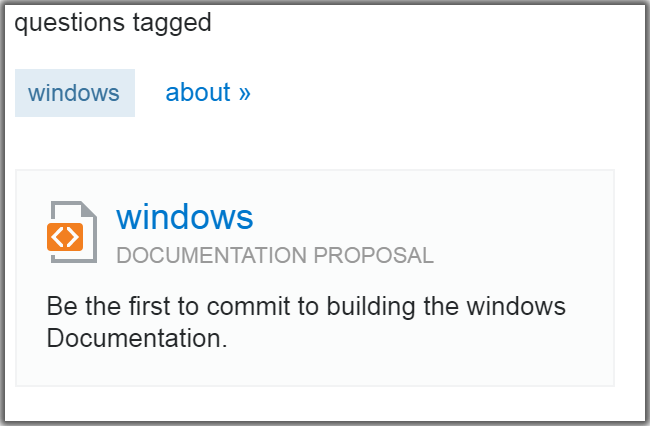 To add Documentation to tags that don’t have any, there’s a small commitment process. To avoid creating ghost towns, tags must be relatively active to get Documentation (a few hundred questions overall, and activity in the last few days). In order to commit, you must have a positively scored answer in the tag and at least 150 reputation. Committers are automatically subscribed to notifications when the commitment succeeds. To be clear, none of the rules or community norms for Q&A are changing. Just because a link points to Stack Overflow Documentation doesn’t mean link-only answers are acceptable now, for example. Documentation is expanding Stack Overflow, not radically altering the Q&A on Stack Overflow. There are things we know we’re going to do that just weren’t ready in time for launch. Documentation is in beta, so we know we’re going to learn a lot in the coming months. This list will grow accordingly. Can someone please clarify the scope of the docs please. The blog post says examples are king, but what I see right now is people adding more or less random topics. What is the point of reiterating the Q&A of the main site? I would understand if docs was for user created API documentation, but I dont see why we need a Stack Overflow in Stack Overflow. I have checked the various preceeding Meta Posts and it's not clear to me what should go into documentation and what is better left for the main site. It's too vague for me right now. It was often mentioned that the documentation is supposed to be an extension to the Q&A site, but my impression is that it is competing with it instead. We have quite a lot of good canonical answers on the main site by now. 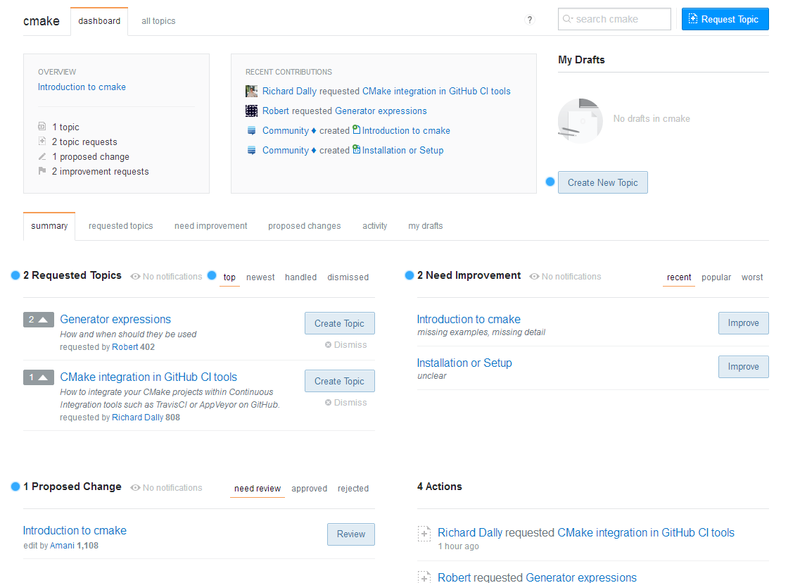 Especially the basic stuff, like how to create an array for example or basically every git command out there, has been covered extensively on the main site. Why repeat that? Also, how do I decide between supplying a self-answered Q&A on the main site or writing it into the docs? Is there some guideline when to choose which? Finally, is there any such thing as a too broad topic? Or off-topic that should not go in the docs? I could obviously write a lengthy tutorial about how to handle XML with PHP, but that would then really be that: a tutorial - something that is deemed off-topic for the main site. What about duplicate content? TL;DR: I miss a clearly defined boundary what should go into docs and what shouldn't. Topics seem poorly organized. If I go to C# all I get is a list of random topics in random order, which seems destined to grow indefinitely. Currently the top 2 are C# 6 features and extension methods, hardly basic or essential knowledge for working with the language. The strong bias for examples over explanations seems to lead to shallow articles that provide little understanding of how things actually work. Many of Stack Overflow's most useful and highest-voted answers are explanations, not examples. Take for instance most of what Eric Lippert writes. The upvotes on examples don't count towards the cap :D not that it is bad, just saying. Four glowing dots on one screen page? That's just terrible, and doesn't convey any information. As requested by JNat, posting some unclear UI here as an answer (rather than opening a new question). I plan to continually amend this answer as more questions pop up, though I won't remove anything from it as they are answered. Feel free to add your own questions here. The process of approving changes is a bit unclear. It seems, unlike review queues, that only one user is required to approve or reject an edit for it to take effect (though its possible there were other hidden "reviews" of the edit that I had not seen, either way, its unclear). Is this intentional functionality? Is there a reputation threshold for making these decisions? Further, there is no way at the present to suggest an edit or simply edit a proposed change. I've already seen a few changes that are valuable, but contain typos or improper formatting, so they shouldn't be approved in their current state. However, the only way to make the required changes is to wait for the change to be approved and then make a subsequent change request to fix the errors. This system feels flawed to me, given that the incomplete change will, for a period of time, be the visible version on the documentation. In addendum to the previous paragraph, it seems that if we approve a change and the user edits their post, comments disappear (this could be that they mark them as completed or something, unclear), and the "approval" buttons aren't returned to the reviewer, such that they can choose to approve or reject the subsequent edit to the change. Another issue I have encountered is the automatic combining of edits within a topic. Say, for example, I edit one example in a topic, and while that edit is awaiting approval, another example is posted. I then edit the new example, but rather than being posted as two seperate proposed changes, both changes are combined into one. This creates a problem for reviewing the changes, as now if one of my edits is worthy of approval but the other isn't, the review needs to decide whether the benefit of the good edit outweighs the loss from the second edit. Further, in combination with an issue posed above, if someone were to vote for approval on an edit, and then I edit a new section, their approval of the first edit is carried into the second edit, which occured after their approval. This is specific to comments on edits, why is there no ability to upvote a comment? This would be a very effective method to show consensus rather than having people comment below: "I agree with @user". Furthermore, comments seem to persist across redacted revisions of an edit, but only if you add a new comment will they show up. Why is there a limit of "improvement requests" on a particular topic/example. Especially in these early hours, there are tons of changes that need to be made. I understand how too many flags could become overwhelming, but it seems better to place all the changes there so that users can pick and choose the ones that they are best equipped to handle. When a user "dismisses" an improvement request, does it disappear for all users or only for that particular user? Should there be a way of "answering" an improvement request that you feel is unnecessary, so that the request can be removed if the community deems the change unnecessary? What is the best practice for adding citations? For example, I proposed a topic in Excel VBA that I know already has a very comprehensive answer on SO written by Siddharth Rout (it is linked to all the time and serves as a go-to location). What is the best way to add this information to documentation? It obviously belongs in documentation, but I don't want to just copy and paste his answer saying, meekly, "credits to Siddharth Rout." It's not specifically just an issue of "stealing" reputation, but I feel as though there should be a way to actually attribute the answer to Siddharth, since it was fully and completely his content. One concern with the current reputation distribution system is the fairness of distributing reputation to all users with "substantive" edits (how is "substantive" itself even defined??). This makes it very easy to "piggy back" on the work of others for reputation gains. 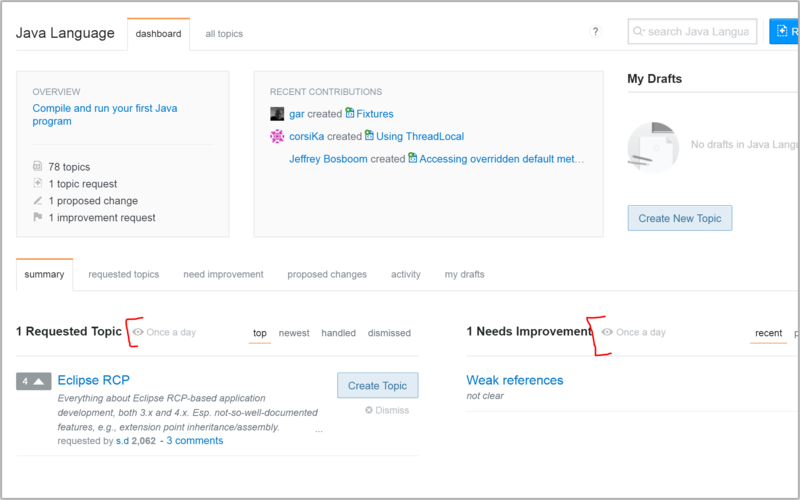 While to an extent, it is a collaborative process, I feel like the reputation gain should be scaled to the size of a user's contribution, rather than being an even distribution of +10 per upvote. Any user could make an early "substantive" change with only a few small edits (but sufficient to trip the barrier), but another user who later makes a huge change, contributing a much larger amount of information, will gain the exact same amount of reputation for subsequent upvotes as the previous user. Thus, by sheer luck, users can unduly gain reputation through others' work. How should tag overlap be handled? For example, we have a vba tag which covers everything related to the language, but also tags like excel-vba and powerpoint-vba. The distinction between those subcategories is essential, because many of the methods and properties, though similar, are substantially different, yet they still fall under the same syntax. I believe that the tags should remain separate, but perhaps for "general topics" that are true for powerpoint-vba and excel-vba, but covered by the vba tag, should be linked to the sub-tags, rather than repeated for completeness. Should some hierarchy be established among tags to make this sort of sub-attribution easier? 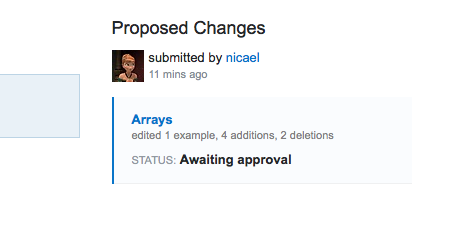 Showing "Awaiting approval" is not really correct. I agree it's nice to be positive, but the proposed change could also be rejected. I suggest to change it to "awaiting review". Otherwise edits are running over each other. For instance, me and some other user edit the same example at the same time. We both put a lot of effort and both edits are fine. If my edit will be approved first, then the other users edit, in order to be approved, will have to delete everything I've done. Or if it will be rejected, everything they've done will be deleted. I can upvote / downvote my own example ... and the first time I do it I get a badge! So that's four, not three frequencies. I downvoted an example with syntactically incorrect code, and it asked me why, but only offered radio buttons. Then I saw I could "request improvement", where I could actually provide a reason why it was wrong. After I typed in the reason and clicked "Request Example Improvement", it then said I couldn't submit that because I'd already complained (paraphrasing, obviously). If the radio buttons do effectively correspond to the request improvement options, the opportunity to provide a reason should be made available then, and you should disable or immediately warn when an option won't be accepted. I was creating my first "Versions" section just now. I saw the grayed out / placeholder text for the format. First feedback: give me an option to inject that example or something similar. I now made a screenshot and then kept that side by side while creating the post :scream_cat:. 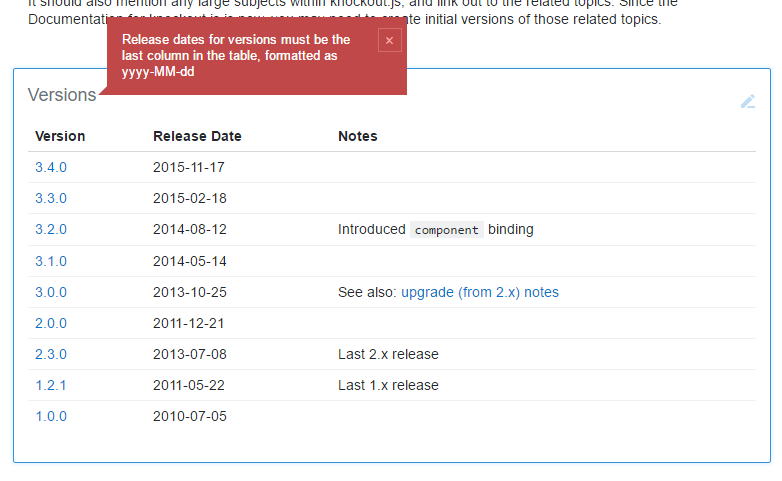 Secondary feedback: allow the Versions table to have multiple extra columns somehow, preferably keeping Version and Release Date columns together. Tag-specific guidelines to be developed such that each tag's documentation can be internally consistent. All users to weigh in on the merits of each suggestion through the tried-and-true method of voting up and down. winapi: Prefer the use of NULL over nullptr for examples, so that they are valid in C as well as C++. python: As much as possible, examples should conform to the PEP-8 style guide. Note that these examples are just that, not a suggestion that they should be the ruling conventions for their respective tags. It needs to be clearer what happens if there are two conflicting edits to docs. If I create a topic and someone else creates a topic, and both drafts are approved, what happens? Does the order of approval matter? If Person A fixes a spelling error and Person B completely rephrases the example that contained the spelling error, which change is incorporated? The real benefit will come when a question can be closed as “read the docs” with a pointer to the docs, and maybe a few lines explaining how the docs answer the questions. At present we are creating documentation for the sake of it…..
We are also creating documentation that is often of a lower quality then what is already out there on the internet for the given topic, this is hard to solve without becoming a “link farm”. The version system is too restrictive on dates. Neither the Haskell 98 Report nor the one for Haskell 2010 have an actual day of the month written down anywhere I can find, but the site only lets me enter YYYY-MM-DD formats. Also, there should probably be some way to distinguish between specification versions and implementation versions and express "Foo 2.4 implements Bar as specified in the Bar 1.1 Report." Clarify how topics are sorted/presented. Prime example: Java Streams. "Introduction to Streams" is the twentieth topic on the page. Yes, that topic currently has issues, they can be fixed. It's discoverability cannot (not for the current implementation of docs). SO Documentation is great, but I just have come accross a case that can be added in the future. I created a topic request in a tag (iOS) and someone comment it to said it could belong to another tag (xcode). I just looked around a bit and saw, that I could dismiss a proposal. I clicked on dismiss (topic "CORS" on "C# Language", https://stackoverflow.com/documentation/c%23/topic-requests/1328), because I would expect that to be off-topic. It would be okay in ASP.NET[-MVC], but it's out of scope for c#. I'd expect there to be an "Off-Topic" reason in dismiss and some sort of "move to another documentation area". Because I have a ton of experience working with the tech, but since I've never answered questions on SO about Moq, I can't get help write docs for it. I thought the whole point was to let people contribute to the cause in their own way? Why should I have to have answer a Q&A to commit to helping with Documentation? It feels like the coupling between Q&A and docs is far too tight right now. I'm not the only one, which has resulted in a request for it under .Net, where it just doesn't belong. I'm really concerned about how all of this is going to end up being organized, or rather, the lack of organization that is occurring right now. It looks like the wild west. The traffic is too low to create documentation. Here is a relatively popular open source lib, with admittedly poor documentation, and yet we can't create documentation for it here. What's the point of this new feature again? So one thing I'm noticing, for me at least, is that for a proposed changes/reviewing of new examples, I can't see what other reviewers might have commented, and I can't change my approve/reject status. Other reviewer comments is could be very important, and perhaps can cause me to consider other things which would make me reject the example. Perhaps I just am missing something that is right there in plain sight, but it doesn't seem to be. It appears that Documentation is very slow when the editor is open. Brings all major browsers on my PC to a grinding halt. The halt occurs almost immediately after the editor appears. After about 10 seconds or so, the page comes back to life, and then freezes completely again. I'm having to use a Markdown editor to do my edits, etc., and then paste them back into the SO editor. Even then, it's quite a tedious task. What is making the editor hold the browser process up? So I spent half an hour writing something up. I clicked "Submit to Review" with nothing visible happening; repeating showed some message along the lines of "no draft selected in workbench" which I couldn't understand. What workbench? After navigating away, my text seems to be gone (other than everywhere else on SE where drafts reappear when you go back in the browser history). Nope, not doing that again for some time. The biggest mistake Documentation has is ignoring completely the Q/A base we already have. Why "post your sample and explanation" instead of "adding this question/answer to"? Right now I refuse to contribute, because I don't feel I can. I know something, but there are John Snow, Bill Gates, John Smith, WhoElseWroteBookOfC#IForgot. Do you want me to write documentation for people more dumb (knowing less) than me? It's basically "common someone write something" game. I'd expect it to be an addon to Q/A. Something what make Q/A experience better. Currently it feels like a complete replacement (in some way): "Let's forget about Q/A and start from very beginning". 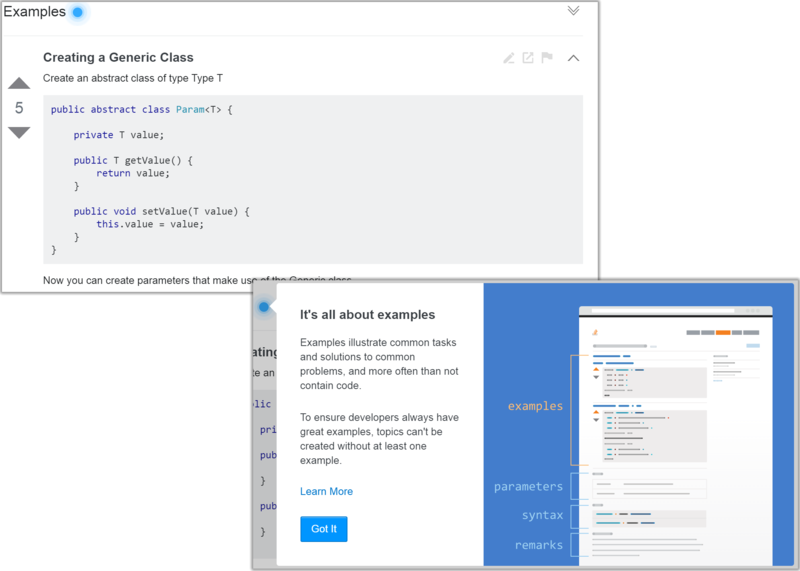 Since Documentation is a /documentation under stackoverflow.com, are you planning on making it available for pt.stackoverflow.com too?